There are billions of websites on the internet and countless websites are going live every day. But what is the point in creating the website if no one visits them and creating the emails if no one receives them? The point is that it is not enough to create a website. You also need to drive the traffic towards your website. Because more people visiting your website means more potential email subscribers. 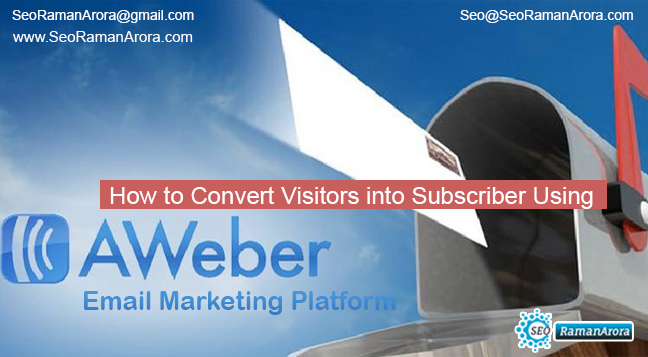 AWeber Email Marketing Platform can convert Your Visitors into Subscribers. Social media helps you to reach the audience in a unique way. You can post the articles on the social media platforms like Facebook, Twitter, LinkedIn, Instagram etc to increase your traffic. But how to know which platforms perform the best? Researches have shown that Facebook remains the top social media platform ahead of Twitter, Pinterest, Instagram or Linkedin. Different social media platforms work differently for businesses. You have to identify which platform works best for you. Build a loyal audience on these platforms so that they can be converted into leads. You can also use the Google Analytics or the analytics provided by the Facebook, Twitter and Instagram etc to track the engagement level. Or, you can check the social profiles of the brands that have a similar audience. You can track them and see how they generated their audience. You should also include the links to your blog posts, profiles so that the people can share your content on their social media pages. Social media posts are buzzy when they are published. The lifespan of the posts is relatively short. This means that the timing of the post is very important. You can track your posts and check how they perform in terms of views and engagements. You can determine which time is most optimal to get the social interactions. Try to post at different times of the day to test the engagement. Create a series of posts that are similar in content and try to post at different times on different days. It will give you an idea of the user engagement. You can easily create an email list with the help of Aweber. To create a new list, click on Manage List on the upper right corner of the dashboard. Now click on ‘Create new list’. Go through all the necessary steps. Name your list and add a description and click next. Add a confirmation message and click on approve message to create a list. Aweber enables you to create email templates that you can use for the email campaigns. There are a lot of Email templates to choose from. Moreover, you can also customize the Email templates if you want. Modify the templates according to your requirements. You can create as many templates as you want. With the help of Aweber, you can easily create email messages or the Newsletters. Creating a message is similar to sending out a campaign. Aweber defines the messages and the campaigns differently. Once your message is ready, start sending out the message. You can either schedule a time to broadcast the message or send it immediately by clicking on the send option and choosing what you want to do. Email campaigns are a great way to automate the sales pitches or just email a list over a period of time. Go to messages and click on campaigns. Click on the button that says create a campaign. Give your campaign a name. Complete the steps that follow and save the campaign when completed. You can tag the subscribers and create a subset list. This allows you to send messages to certain subscribers. Aweber allows you to segment the list. After you have tagged the subscribers, then you can segment the list. Autoresponders are the follow-up emails that are sent to your list. They can include whatever information you want. You can add as many as follow up messages to send at a scheduled time. You can also attach files with your emails. All you have to do is to go to the message page where you create a message. At the bottom, you can see a paperclip. Click on that and find the file that you want to upload. Click on upload and your file will be sent with your message. Aweber is a platform where you can successfully handle your email marketing campaigns. Aweber gives you an opportunity to convert your visitors into your long-term subscribers. If you too want to boost your email marketing, you can sign up to the Aweber and avail their services.